Definition at line 264 of file llspatialpartition.h. Definition at line 268 of file llspatialpartition.h. Reimplemented in LLWaterPartition, LLTreePartition, LLParticlePartition, LLVolumePartition, LLVolumeBridge, and LLBridgePartition. Definition at line 2541 of file llvovolume.cpp. References FORCE_CULL_AREA, LLSpatialGroup::getData(), LLFace::getGeomCount(), LLFace::getIndicesCount(), LLFace::hasGeometry(), i, LLSpatialGroup::mBufferUsage, LLSpatialPartition::mBufferUsage, mFaceList, LLFace::mLastVertexBuffer, LLFace::mPixelArea, LLSpatialGroup::mSpatialPartition, LLFace::mVertexBuffer, NULL, and S32. Referenced by LLVolumeBridge::addGeometryCount(), LLVolumePartition::addGeometryCount(), and LLSpatialPartition::rebuildGeom(). Definition at line 2905 of file llspatialpartition.cpp. Referenced by LLVolumeGeometryManager::rebuildGeom(), and LLSpatialPartition::rebuildGeom(). Implemented in LLWaterPartition, LLTerrainPartition, LLTreePartition, LLParticlePartition, LLVolumeGeometryManager, LLVolumePartition, LLVolumeBridge, and LLBridgePartition. 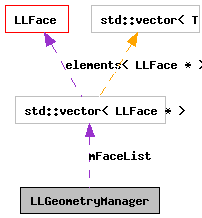 Implemented in LLSpatialPartition, LLVolumeGeometryManager, LLVolumePartition, and LLVolumeBridge. Definition at line 267 of file llspatialpartition.h. Referenced by addGeometryCount(), LLParticlePartition::addGeometryCount(), LLTerrainPartition::getGeometry(), LLParticlePartition::getGeometry(), and LLVolumeGeometryManager::rebuildGeom().